In addition to the Lawrence Sofa, we also really loved the Sofia Settee and Sofia Chairs. They’re completely customizable, which we had a lot of fun playing with. We went with a base fabric of the Queens Velvet Snow, and on the backside we did a really fun fabric, the Stockton Cream, which has a really pretty diamond stitch pattern but still kept the overall look of the chair very neutral. Some of my other favorite pieces include this gorgeous Andrews coffee table, as well as the fireplace screen (which really stands out!). Another favorite? 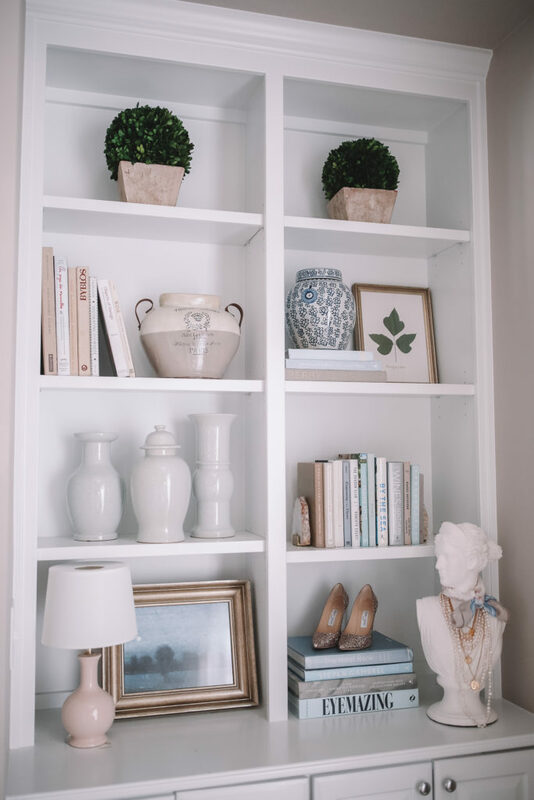 All of the decor for the built-in bookshelves! 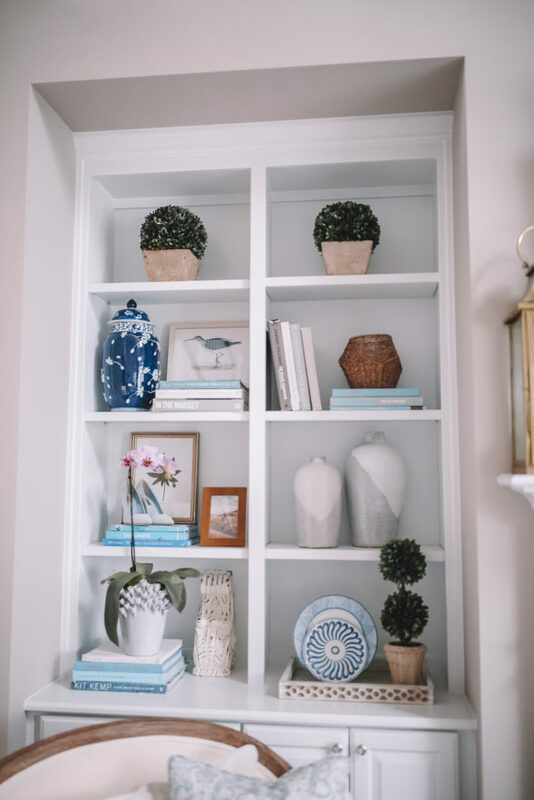 When we originally bought our house, I was clueless to how we should style these shelves, but Ballard Designs put together a whole plan for them! These decor pieces are so easy to mix and match and switch out with the seasons. 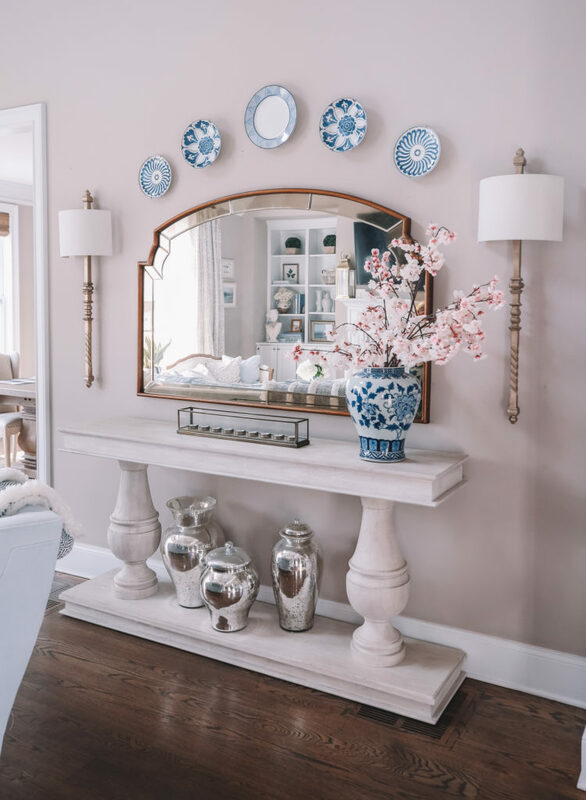 For this little corner of our living room, Laura suggested this Andrews console table which I think is STUNNING (it also matches our coffee table!). 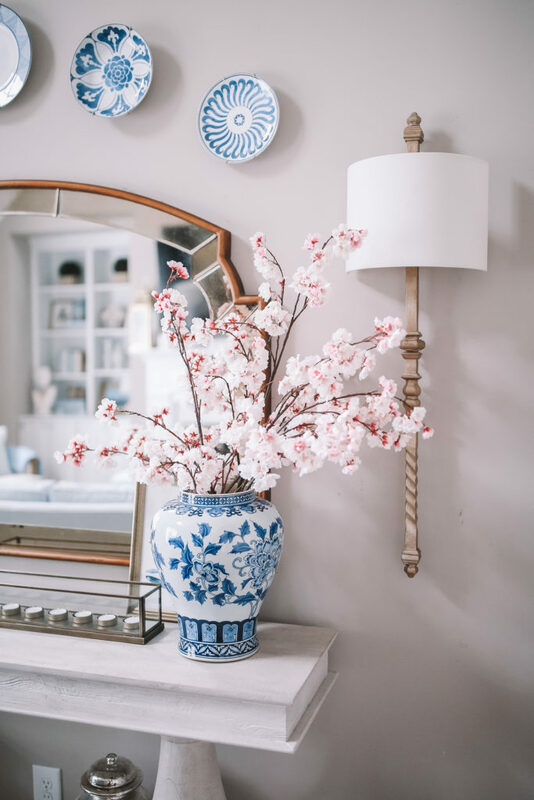 We added these mercury glass vases to the lower shelf, these cherry blossom stems to a large ginger jar for a pop of color, and hung blue and white plates above the mirror. She also recommended having these Cartagena Sconces installed – I was worried they would be difficult to install, but our electrician knocked it out in less than an hour. 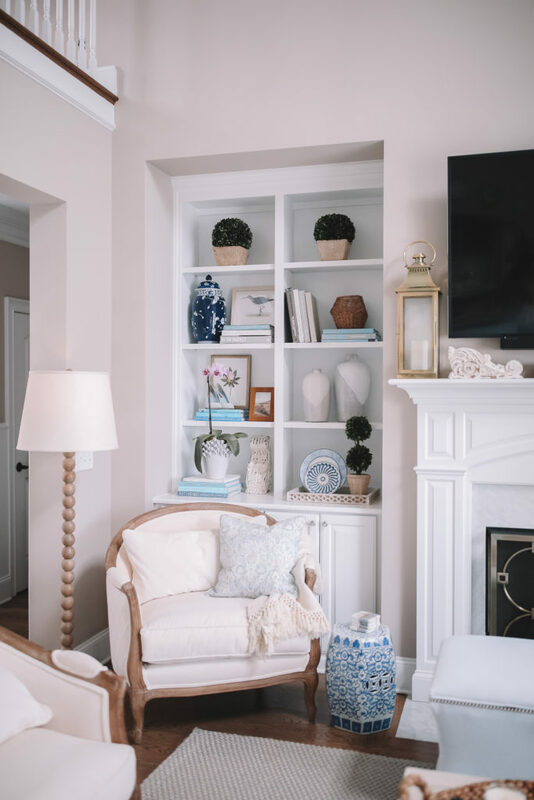 I would NEVER have thought to put sconces there, but it really completes the room – when they’re turned on, the extra light makes it feel so cozy in the living room! We are so in love with our new space!!! I love how it’s sophisticated and elegant yet cozy and comfortable at the same time. My favorite time of day is 5 p.m. when I’m finished with work for the day – I pour a glass of rose and snuggle up with Winnie to watch reality TV before Chris gets home from work – hehe! When we are hosting guests, it’s the perfect room for us all to hang out in – nine people can sit comfortably in the space. 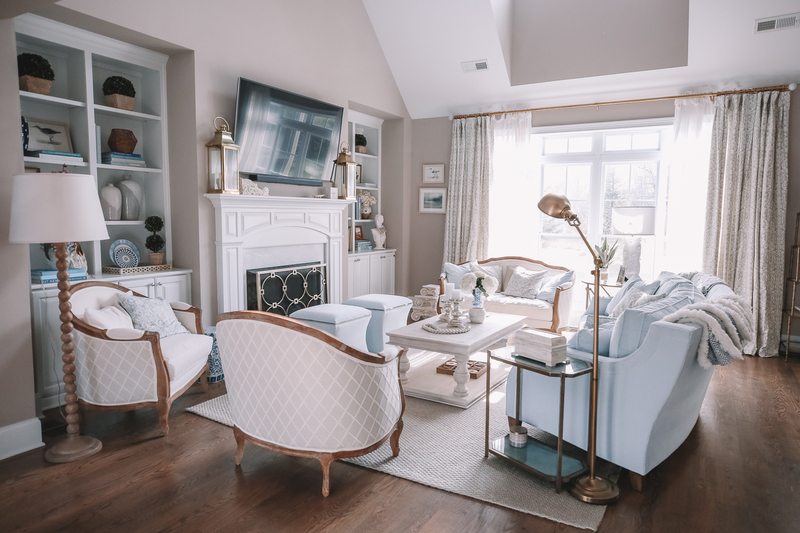 Thank you, thank you, thank you to Ballard Designs and Laura for such a wonderful job on the space – we will forever be grateful and can’t wait to create all new memories in our living room! Can you link your curtains? The curtains are custom-made from Ballard Designs in the Emmeline Gray Fabric! Soooo Beautiful! You are my favorite blogger to follow! Love your taste in everything! 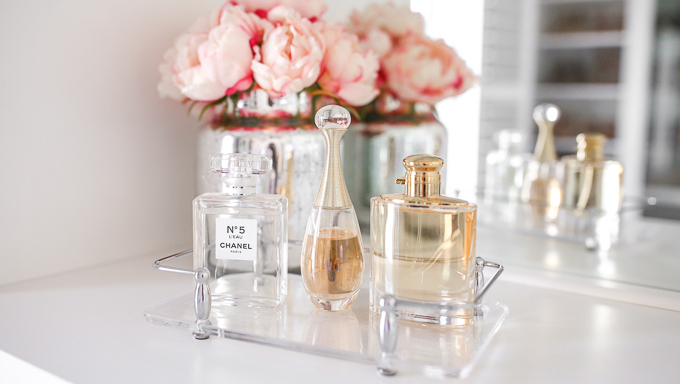 I’ve incorporated some of the pieces you have in your home into mine and just love it! 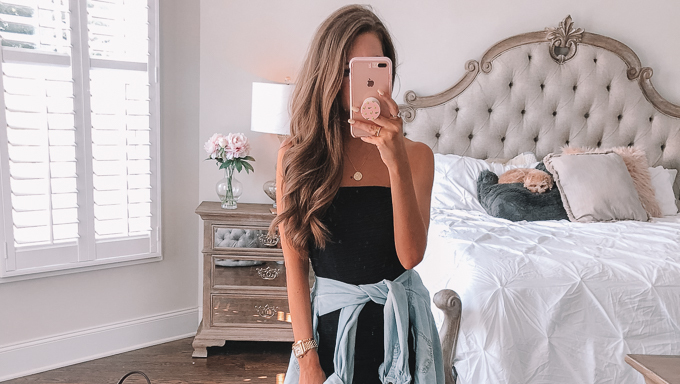 I love the same color palette’s as you and things in home decor but never knew really how to set up my house in a way to reflect that until I started following you. You’re truly inspiring!!! I look forward to seeing what’s new that you’ll post! Talk about living room goals!! I absolutely love all the decor pieces and the furniture! Can you come re-do my space?! Your living room is amazing! Talk about decor and room goals. I love all of the decor pieces and furniture! Can you come and decorate my space? This is such a beautiful space, I’m in love! I love your living room! It looks fabulous!! Well done! You did a great job! Love love love how your living room has been furnished! It looks gorgeous! Love this space! What color is the paint on the walls? It’s so beautiful! Just wondering what paint color you used on the walls. Love to know about your curtains. Your look is similar to mine but I am having a hard time dressing the windows. Thanks so much for sharing your space is beautiful! Thank you! The curtains are custom-made from Ballard Designs in the Emmeline Gray Fabric! I love your drapes and paint color. Could you please tell me what color that is on your walls? Sorry , but – Zzz…pretty like a precocious poodle….but lacks real interest too matchy-matchy, furniture arrangement feels tight. 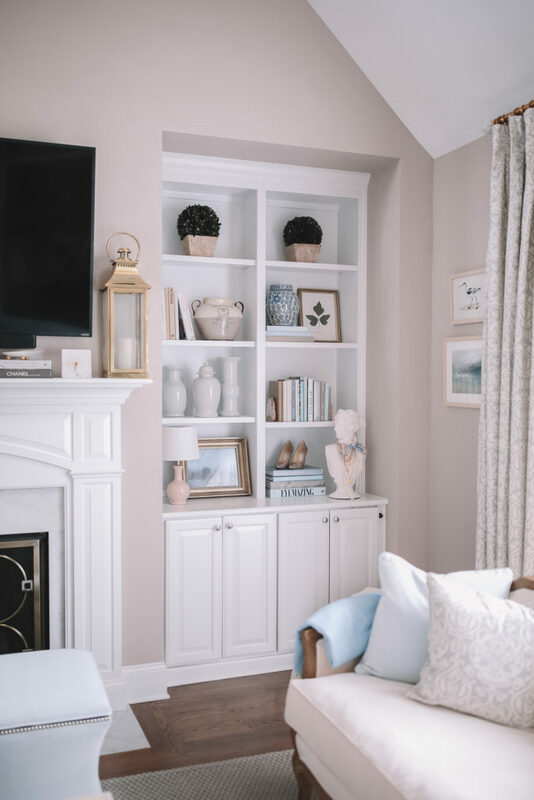 Very traditional , old school for a young couple w/ an awesome space …would have liked dark blue or patterned wall paper lining the back of built ins…and relics from your travels displayed …just some personality to the room.. Shoes on books in the bookshelf?! My fave the interesting pot the orchid is in. It looks so beautiful! I love the soft blue & white color palette. 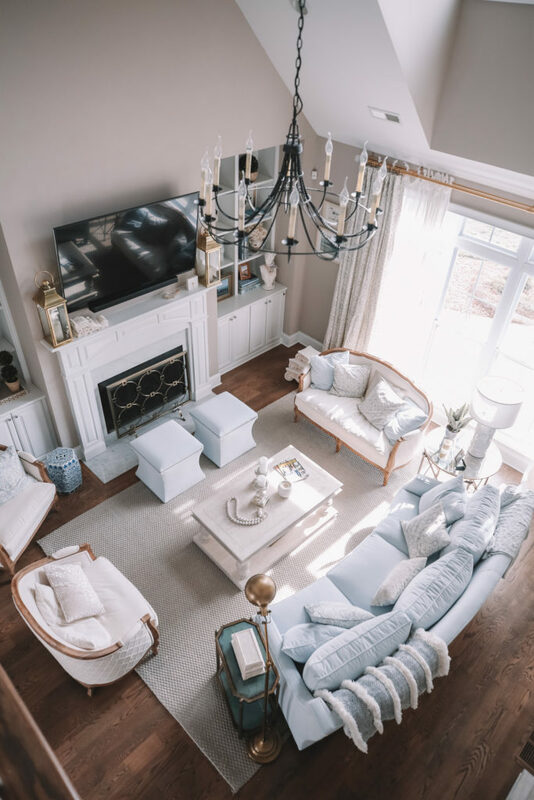 Your living room looks absolutely wonderful! I am obsessed with that living room! It looks very prestine yet inviting and the different shades go so well together! The big sofa looks sooo comfortable and I love how the designer styled the built-in shelves. 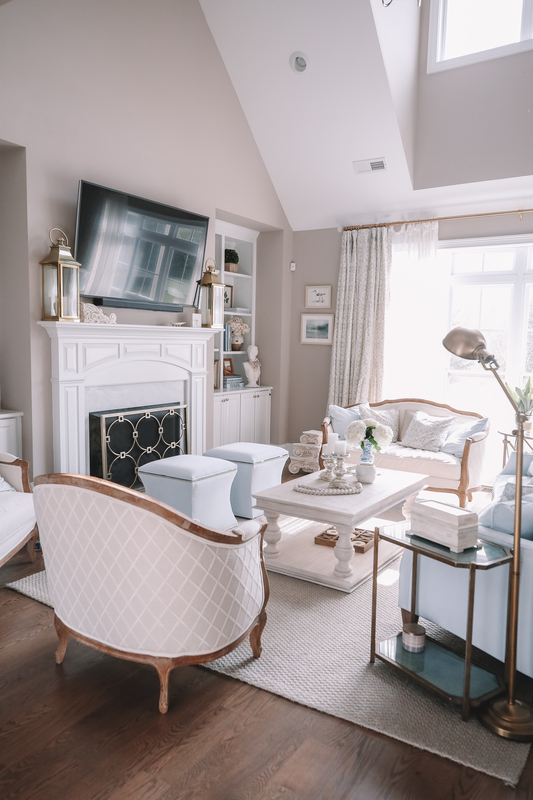 Your living room is beautiful – dainty, cozy and so inviting! Love the finished product! Your living space is SO beautiful, Caitlin!!! I love how it’s so elegant, but looks like you can live in it without the worry of messing things up. How much of the design was yours and how much of it was Laura’s? I have been following you since 2014 and this is my favorite post till date! The fact that you styled the shelves with a pair of heels is everything to me! Absolutely beautiful! Love your style so much! Where is the mirror from? Can you link your vintage looking brass floor lamp? I have a similar table version and it would go perfect in my living room! Thanks!! This is so gorgeous! Do you have a go to spot for the plates you hung on the wall and other little antiques? Hi Caitlyn, Do you have the link to the small tray in the shelves on the bottom? It has some plates in it and a topiary next to it. The edges of the tray look like they have perforated designs. It is really pretty. Thank you. 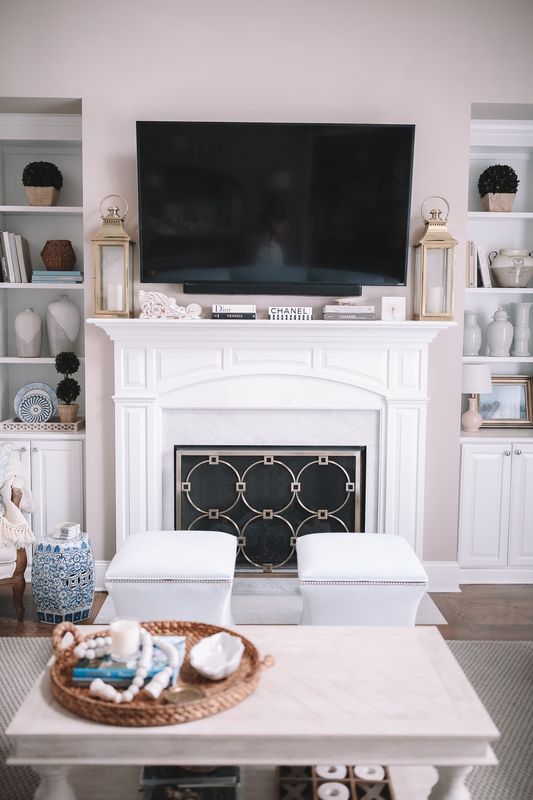 I rarely comment on blogs, but I found your living room and its décor absolutely stunning! Simply perfection. You will be enjoying this little piece of heaven for a long time to come. Thank you for sharing. The room looks absolutely incredible Caitlin! I truly love every little detail. A space y’all will enjoy for years and years to come! I love all your decorating posts! 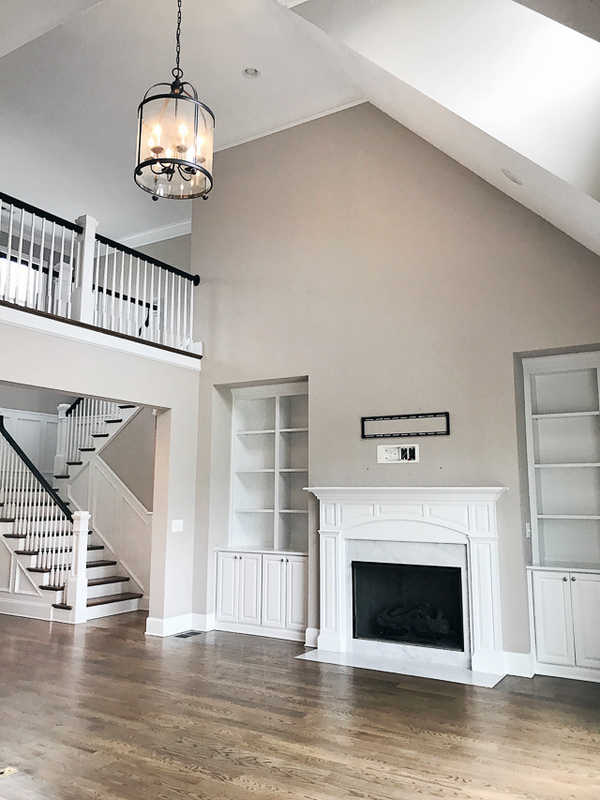 Can you tell me what color are the walls painted in this living room post? Your living room is absolutely gorgeous! 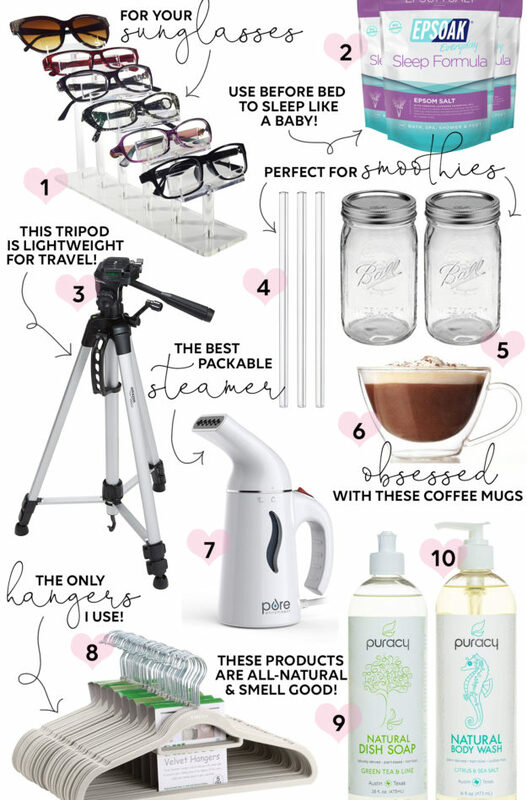 I’m definitely bookmarking your page to order things for my upcoming living room re-do! Oh I love your style so much! Where is the mirror from? And the plates you mounted above them? I love this idea! Hi Caitlin, It is so exciting to see the final reveal!! 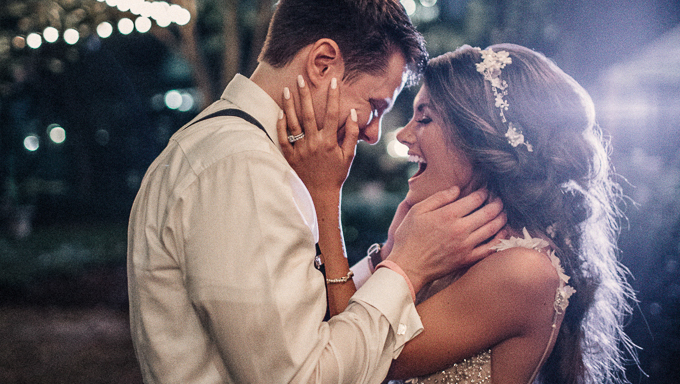 I loved working with you and Chris and I can honestly say that you two were some of my favorite clients I had the pleasure working with while at Ballard Designs. Not only do you have style and grace but also you are such a fun person to be around! 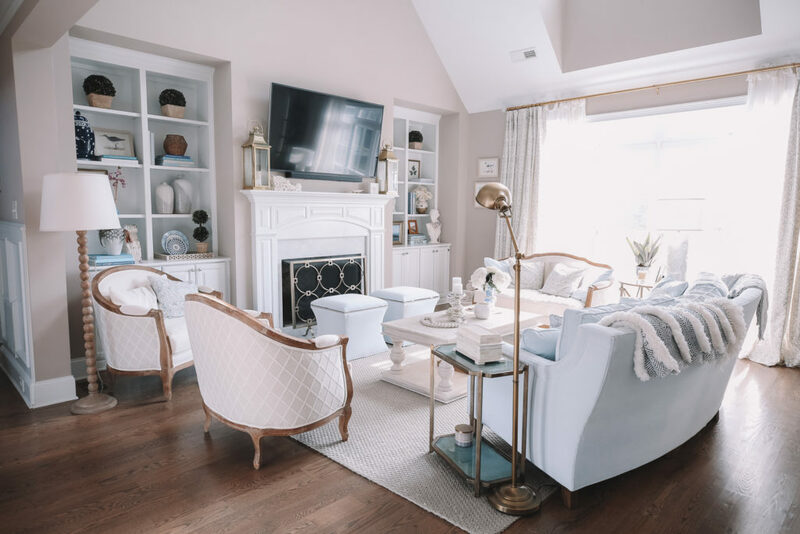 I am so happy to know you love your room and that the final design is what you had envisioned; as a designer there is no better compliment than knowing you have created a room that your clients enjoy and it is a space that you love to be in!! Where is the rug from?! SO gorgeous! Love the entire space! So cozy! Love the blue sofa! Absolutely gorgeous! I love how cozy it looks, and yet so elegant and beautiful. LOVE HOW IT ALL CAME TOGETHER! Truly beautiful. I love the blue tones so stinkin’ much! It’s so elegant and classy, yet welcoming and inviting!